Friends from Sausalito, Pete and Nance, had been considering helping those in need on a one-on-one basis for a year or so, until they laid eyes on The Kindness Bus. The more than subliminal effect was immediate. It set them on a course to help individuals throughout northern California. 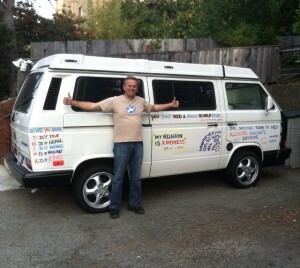 I was honored to see that they had recently purchased a VW bus…and they had started painting its exterior!!! They will be launching a website and I will post it at that time. Great things will come because of this mission and many will be helped. Thank you Pete and Nance. This entry was posted on Tuesday, November 19th, 2013 at 7:20 pm	and is filed under Kindness. You can follow any responses to this entry through the RSS 2.0 feed. You can leave a response, or trackback from your own site.